As the first state to declare its freedom from England, New Hampshire is an incubator of first-movers and history makers operating on the ground floor of change. Living in a culture of advancement and innovation, you know the importance of adapting and staying relevant in an ever changing landscape. Let’s apply that same fervor to getting you a qualified New Hampshire court reporter. With various technologies upending industry after industry, don’t be the last to implement the time saving, budget slashing advancements in realtime ready video enabled streaming court reporters, interpreters, and case management software. Discovery Litigation utilizes the fastest moving tech to get you the New Hampshire court reporter that best fits your needs. No deposition is too remote for our services. We’ll never compromise quality or expertise for geography. With Discovery Litigation Services, you now have that luxury as well. 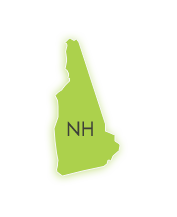 Schedule your deposition or give us a call and we’ll utilize our wide reaching network of professional court reporters to find the right New Hampshire court reporter for you today. Let Discovery Litigation Services take care of all of the legwork and enjoy the freedom of time, and freedom from inefficient spending to focus on winning your case, growing your business, and raising your family. WHY HAVE YOU BEEN NEGLECTING NETWORKING AND OUTREACH? If your answer is time, then you’ve come to the right place. Discovery Litigation Services empowers you to reclaim your day giving you more time to grow. If you’re bogged down by responsibilities and client requests, and can never quite finish doing everything you need to do, we can help. Every moment of inefficiency from the hiring process to the deposition itself is a timesink stealing your days, weeks, and months. Discovery Litigation Services streamlines everything. You have more pressing matters to attend to than waiting on your court reporter to set up and be ready. As important as the court reporter is to the final record, the court reporter is not the star of the deposition. The court reporter should rarely be the center of attention. When you have a real professional in your midst, you’ll hardly notice her at all. Stop waiting for that court reporter to find the conference room where the deposition is taking place. You’d be surprised how often a freelance court reporter shows up late to a deposition sucking up valuable time and putting your case in jeopardy. A rushed, haphazard deposition can prove disastrous. Discovery Litigation Services will deliver you an experienced court reporter anywhere in the world on time and ready to work. Your case is too important to be hindered by a distracting freelance court reporter who couldn’t find the building. We have a better alternative. The professional court reporter respects the value of your time as well as her own. She understand the effort and planning that went into putting the deposition together and appreciates the seriousness of the case. Discovery Litigation Services’ court reporters will never disrespect the gravity of the situation by pulling unwarranted attention back onto herself through unprofessionalism or tardiness. The main responsibility of a court reporter is to ensure an accurate official record. This requires a skilled professional to perform elegantly and without distraction in a high pressure situation. Yes, there are times in which a court reporter will need to halt the proceedings for the sake of clarification, but there are right ways and wrong ways of doing this. Employing an unprofessional, tactless court reporter can quickly transition from a virtually unnoticed teammate inscribing each word into the record to a liability. When a court reporter doesn’t possess the skills necessary to strategically interject at the right time in the right way it can obliterate the flow you worked so hard to establish. Consistently disrupting your deposition can put the whole proceeding on shaky grounds. From efficiency within the deposition and a team of professionals to handle the scheduling process, to a time saving web-based platform that streamlines the management of your deposition, Discovery Litigation Services offers you a way out of the time stealing vortex. WHY CHOOSE DISCOVERY LITIGATION SERVICES? Maintaining your budget is of the utmost importance to Discovery. We offer transparent pricing with no hidden fees. We make it clear for you to know exactly where each dollar is going and to report back to your client. With services reaching far beyond court reporting, Discovery Litigation Services is a one-stop-shop to handling everything you need done at a supreme level of quality. Discovery Litigation Services offers over twenty years of experience with a smile. We will never operate from a self centered focus. Our drive is to provide you with the highest quality of service, and the most relevant tools to simplify your process all at a price that fits within your budget. We center our efforts around what’s best for you, and will maintain the personal relationship that best services your needs.